These Pumpkin Swirl Pancakes with Pumpkin Butter Topping have to be the best pumpkin pancakes I’ve ever had. Swirled with pumpkin butter, dusted with powdered sugar and then drizzled with more pumpkin butter, they’re the perfect way to start your day! As I sit here typing this post, I anticipate tonight’s episode of Breaking Bad. In fact, I probably won’t finish this post before I go downstairs to watch the show. This probably sounds a little weird to you because you’re reading this and it’s probably sometime Monday morning or afternoon and tonight’s episode of Breaking Bad is long over with. But right now it’s Sunday evening and there are exactly nine minutes until the next episode airs. If you aren’t familiar with Breaking Bad, well, it’s only one of the best shows on television. The show is in its final season and there are only three episodes left. I can honestly say that I’ve never been so excited to watch an episode of a television show in my life. And I’ve been pretty excited about some of The Walking Dead episodes. But enough of the TV talk and confusing you with the time of day it is. Let’s talk about pumpkin again. 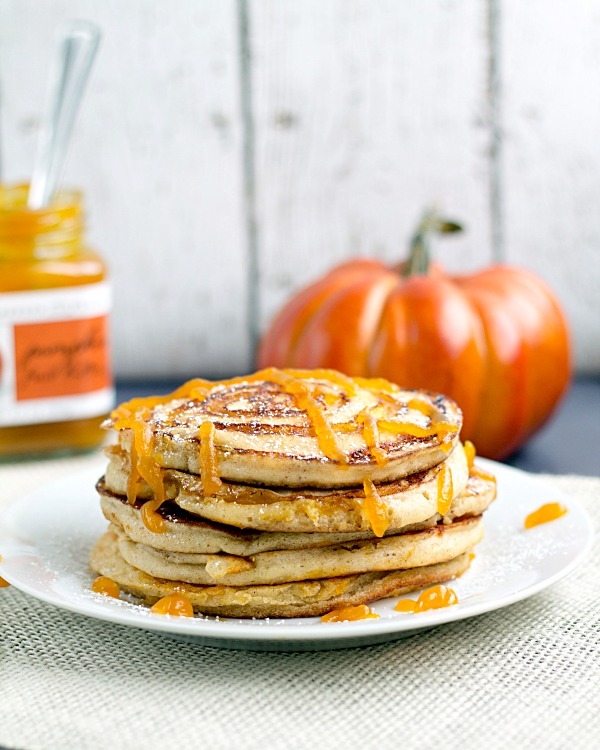 Pumpkin pancakes. Ken likes pancakes. A lot. I don’t mind them. They do taste good. And they are easy to make. But I can take them or leave them. Sometimes I make pancakes for him while making something else for myself. But these Pumpkin Swirl Pancakes are a different story. They are amazing! The key to what makes them amazing is the pumpkin butter. Have you ever had pumpkin butter? It reminds me of apple butter but with hints of pumpkin. Well, I wouldn’t call them hints. You can definitely taste the pumpkin but it’s a much different taste than pumpkin puree or any of the usual pumpkin flavored treats. I used about 3/4 of a jar of the pumpkin butter to make these pancakes. I used more than I thought I was going to use but that’s ok. I am placing an order to purchase more of this pumpkin butter because it’s so darn good! More recipes to come, teehee! For now, enjoy this recipe. Preheat a non-stick skillet to medium heat. In a large bowl (I used one with a spout) whisk together the flours, sugars, cinnamon, nutmeg, salt and baking powder. In another bowl, whisk together the milk, egg, oil and vanilla. Add the milk mixture to the flour mixture and mix well. The mixture should be slightly lumpy. Pour ¼ C of batter for each pancake onto the skillet. I do two at a time. 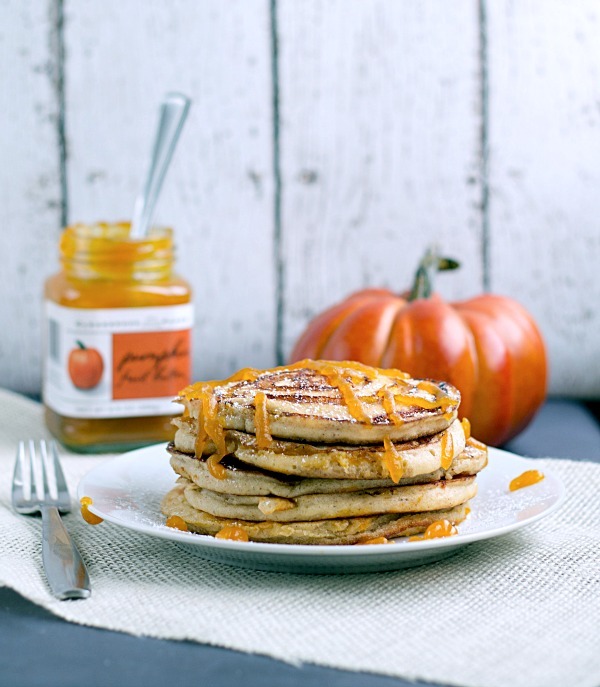 Then squeeze the pumpkin butter in a circular motion onto the pancakes. I put the pumpkin butter into a ziplock bag and cut off the corner so I could squeeze it out. Bake for 2-3 minutes per side. Spread butter (or Country Crock, as I did) on top of each pancake before stacking. Top each stack with powdered sugar and then squeeze some more pumpkin butter on top. These are gorgeous Julie! I love pumpkin pancakes! I have to find me some pumpkin butter! I hear so many people talk about Breaking Bad, we have to start watching that! Thank you, Tanya! I can’t remember the brand I used but I will go look at the jar so I can let you know. I can’t tell what it says on the jar in the photos! And yes, you must watch Breaking Bad! Thank you so much, Abbe! I’m already scheming up my next pumpkin recipe! And you are right, it makes things so moist and delicious! I don’t know what’s killing me more, these pancakes, or last nights episode!!! OMG. That episode was INTENSE! I actually lost sleep over it! What did you think of last night’s episode? Not as intense as last week’s but still good! I loved the ending! 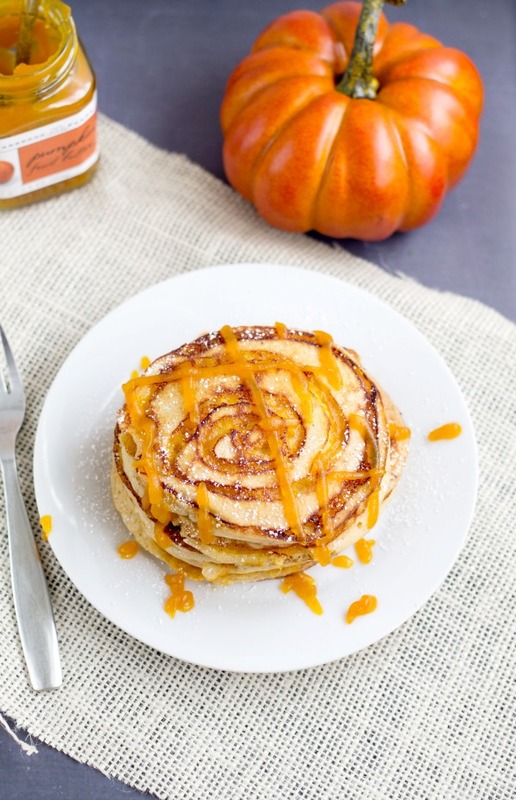 These pancakes look beyond delicious,I love that pumpkin butter swirl! And why have I never tried pumpkin butter before? Sounds like something I need in my life. I do not know! You definitely need to try it out. It’s amazing! I am pancake crazy! These look so delicious Julie! Those look some delish! 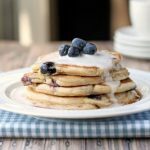 We are major pancake lovers here and always looking to try new ideas. I’ve never had pumpkin butter and it sounds like it’s amazing!! Becuse these pancakes are crazy good looking. And talking about TV, Breaking Bad is on my list for shows to watch next on Netflix. Everyone says it’s the best show on TV so I am giving it a try. This weekend I started and finished Orange is the new Black. Have you heard of it? You should try it! You really need to try pumpkin butter, Zainab! It’s so good! And Breaking Bad is a must see. I have not watched Orange is the New Black. I will have to see what it is about! Such a great show! Hope you have a good week! They were fantastic, Paula! That pumpkin butter is SO good! OMG. Pancakes for 57 days? That’s a great way to start every morning! Oh my goodness, this is just amazing! So much pumpkin action going on –I’m in love! Pinning! Have a great week Julie! Thank you, Anne! If you haven’t tried pumpkin butter, you must. It’s SO good! What a great idea, Julie! Very inventive, and they look just as tasty! 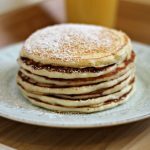 John is a big pancake lover and sometimes we have for dinner – will need to give these a try – pinned!! I hope you enjoy them, Deb! Thanks for the pin! Can I come over for breakfast?? Pinning, making and eating these this weekend! Sure! I hope you enjoy them. Thanks for the pin, Julianne! Sounds so yummy. How do you get the swirl affect? I put how to get the swirl effect in the instructions but what you do is put the pumpkin butter in a ziplock bag, cut a small piece off of a corner of the bag and then squeeze out the pumpkin butter onto the pancakes in a spiral shape. Hope this helps! Oh Breaking Bad is so much better than The Walking Dead! I like The Walking Dead but it has nothing on Breaking Bad! You definitely should try pumpkin butter. It’s so good! OMG!! Julie, these pancakes look to die for! I absolutely have to make these for my daughter, she’ll flip! Thanks for sharing your recipe – pinning and buffering, plus sharing on FB tomorrow! Have a great evening! Pumpkin butter is easily found at local Farmer’s markets this time of year…Not CHEAP, but definately worth every penny!!! I will have to check out the local market to see if I can find any. If not, I can order it online. Thanks for the tip! That’s a better idea. Thanks at least now i don’t have to type a recipe up or worse hand write it. Thank you so much they will love this. You’re welcome! Yes, that would be a pain to write everything out! I will have to try making my own pumpkin butter one day. Thanks for the tip! 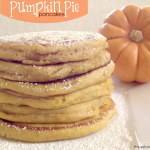 These look so delicious, and I love Pumpkin Butter! Thanks Julie! Pumpkin butter is made of so much WIN! Yo can make pumpkin buyer is really easy. A soon as I get to a computer instead of this stupid phone I’ll give you a quick and eat recipe. It’s delish. Also I love your recipe I plan on giving out some of my home canned pumpkin butter for Christmas is it ok if I give then this reboot with your Web sure and name on it? Pumpkin butter not buyer. Oh this phone. Also I love your recipe. I plan on giving out some of my home canned pumpkin butter for Christmas, is it ok if I give them this recipe with your Web site and name on it? Thank you for the compliment. I would rather you give them a link to the recipe rather than give them the recipe word for word. They can come to my site and print the recipe from my site. It will be formatted in recipe format if printed from my site.